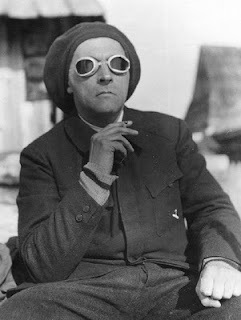 “He is one of those tormented spirits who seek in art the solution, not to the problem of success, but to the problem of their own being.” So said the critic Tadeuz Boy-Żeleński, writing about the great Stanizlaw Ignacy Witkiewicz. I know what you're thinking: “the great Stanizlaw Ignacy What-kee-what?” No, Witkiewicz isn't some hoax, or the latest literary persona projected by Kent Johnson's fervid imagination. Witciewicz — who also went by the name Witacky, as well as Witkas, Witkrejus, St. Witacky à la fourchette, Vitcatius, and Mahatma Witkac, among others — was a Polish modernist writer and painter, a prolific playwright, essayist, portraitist, and novelist, and a kind of eastern European Aldous Huxley, pioneering new explorations in drug-fueled consciousness (his specialization was peyote). Under-appreciated in his short lifetime, which ended with a tragic suicide while Hitler and Stalin were dividing Poland, he became an important figure to Polish intellectuals when he was rediscovered in the 1950s. If this were the 1980s, I'd say Witkiewicz was best known to American readers via Czeslaw Milosz's book The Captive Mind, which takes its premise about a magic pill that reconciled Europeans to the decline of their civilization from Witkiewicz's novel Insatiability, but since the end of the Cold War The Captive Mind seems to have slipped out of our collective consciousness. So I'm guessing Witkiewicz's works are terra incognita, even for people into the freakier forms of modernist literary and artistic expression. He was little more than a name to me until I started pawing through Daniel Gerould's Witkiewicz Reader, which has been sitting unread on my shelves for God knows how many years. One of the best-known pieces in the book (if we can describe any of them as well-known outside of Poland) is the wonderful "Rules of the S.I. Witkiewicz Portrait-Painting Firm," a 1928 document lying somewhere in the territory between manifesto and business contract — a strange and little-visited country indeed. It's fascinating, because in it's strange, farcical way it shows the contradictory position of the modernist artist caught between two apparently irreconcilable forces: the power of the market to determine the nature of cultural production; and the assertion of the artist's necessary autonomy from all things save the dictates of his own imagination. Even the title of the piece raises questions about the relation of art to the marketplace: a painter, after all, is meant to be an individual sensibility, but here the painter is presented as a firm, a collective business enterprise. In the text itself, we read about certain behaviors of the clients putting the firm in a bad mood, though, so there is some confusion about the nature of the business enterprise: is it a single, moody genius, or is it a business operation? It is both — because of the conflicting demands of artistic autonomy (be a genius! paint out of individual inspiration!) and of the marketplace (paint to order! produce something that sells, preferably on a large scale, and by systematic methods so as to guarantee quality and consistency!). As Witciewicz/Witacky/Witkas/Witkrejus/St. Witacky à la fourchette/Vitcatius/Mahatma Witkac knew, identity had to be plural and even contradictory under modern conditions! 1. Type A - Comparatively speaking, the most as it were, 'spruced up' type. Rather more suitable for women's faces than men's. 'Slick' execution, with a certain loss of character in the interests of beautification, or accentuation of 'prettiness'. 2. Type B - More emphasis on character but without any trace of caricature. Work making greater use of sharp line than type A, with a certain touch of character traits, which does not preclude 'prettiness' in women's portraits. Objective attitude to the model. 3. Type B + s (supplement) - Intensification of character, bordering on the caricatural. The head larger than natural size. The possibility of preserving 'prettiness' in women's portraits, and even of intensifying it in the direction of the 'demonic'. 4. Type C, C + Co, E, C + H, C + Co + E, etc. - These types, executed with the aid of CHO5 and narcotics of a superior grade, are at present ruled out. Subjective characterization of the model, caricatural intensification both formal and psychological are not ruled out. Approaches abstract composition, otherwise known as 'Pure Form'. 5. Type D - The same results without recourse to any artificial means. 6. Type E - Combinations of D with the preceding types. Spontaneous psychological interpretation at the discretion of the firm. The effect achieved may be the exact equivalent of that produced by types A and B - the manner by which it is attained different, as is the method of execution, which may take various forms but never exceeds the limit(s). A combination of E + s is likewise available on request. Type E is not always possible to execute. 7. Children's type - (B + E) - Because children can never stand still, the purer type B is in most instances impossible - the execution rather takes the form of a sketch. So there's the range: from Joshua Reynolds-style "prettified" idealizations, in the manner of the patron-driven world of eighteenth-century art, to the more "subjective" work of the contemporary genius, who offers us less mimesis and more of his own (sometimes drug-fueled) idiosyncratic vision. From Augustan prettiness to Romantic opium-dreams to Modern quasi-caricature, it's all there. But the important thing is that it's all a menu, a market-based system of ordering. The market makes all styles are available, even those of the self-absorbed dreamer, the figure we think of as ignoring the market. It's not the case that the producer of the paintings is totally disempowered in this system, though: in fact it is he who is dictating the terms of the contract. Any sort of criticism on the part of the customer is absolutely ruled out. The customer may not like the portrait, but the firm cannot permit even the most discreet comments without giving its special authorization. If the firm had allowed itself the luxury of listening to customers' opinions, it would have gone mad a long time ago. We place special emphasis on this rule, since the most difficult thing is to refrain the customer from making remarks that are entirely uncalled for. The portrait is either accepted or rejected - yes or no, without any explanations whatsoever as to why. Inadmissable criticism likewise includes remarks about whether or not it is a good likeness, observations concerning the background, covering part of the face in the portrait with one hand so as to imply that this part really isn't the way it should be, comments such as, 'I am too pretty,' 'Do I look that sad? ', 'That's not me," and all opinions of that sort, whether favourable or unfavourable. After due consideration, and possibly consultation with third parties, the customer says yes (or no) and that's all there is to it - then he goes (or does not go) up to what is called the 'cashier's window', that is, he simply hands over the agreed-upon sum to the firm. Given the incredible difficulty of the profession, the firm's nerves must be spared. Asking the firm for its opinion of a finished portrait is not permissable, nor is any discussion about a work in progress. Inadmissable criticism likewise includes remarks about whether or not it is a good likeness, observations concerning the background, covering part of the face in the portrait with one hand so as to imply that this part really isn't the way it should be, comments such as, 'I am too pretty,' 'Do I look that sad? ', 'That's not me," and all opinions of that sort, whether favourable or unfavourable. The firm reserves the right to paint without any witnesses, if that is possible. So we've got the isolation of the autonomous artist, alone with his genius, enshrined in the terms of a market-based contract: art is both autonomous and heteronomous (that is, based in a market system). Witkiewicz is out to have it both ways, or at least to point out how difficult the position of the artist becomes when he's supposed to be both autonomous and able to succeed in the modern marketplace. The portrait may not be viewed until finished. The technique used is a combination of charcoal, crayon, pencil and pastel. All remarks with regard to technical matters are ruled out, as are demands for alterations. The firm undertakes the painting of portraits outside the firm's premises only in exceptional circumstances (sickness, advanced age, etc.) in which case the firm must be guaranteed a secret receptacle in which the unfinished work may be kept under lock and key. The firm will, it seems, come to you. But only if you can replicate the private conditions of the autonomous genius, free from distraction, free from any input on form or medium, and any expression of desire for revision. You're the boss, Mr. Customer — just so long as we understand that the artist answers to no one. In the end, there's an admission that the artist is not as empowered in the market as he might wish to appear: "Lacking any powers of enforcement," says Witkiewicz, "the firm counts on the tact and good will of its customers to meet the terms." How, then, is the conundrum of autonomy and the market resolved? The artist becomes a kind of Blanche Dubois, and depends on the kindness of any stranger entering the studio with a checkbook.